In the era of the great Hollywood thrillers (the 90’s) this first Tom Clancy novel out of the gate is a superlative franchise vehicle. Clancy’s sprawling narrative is executed with precision with John McTiernan’s superb directorial flare, and remains one of the best Cold War era spy thrillers. Coming off of the influential Die Hard, Red October finds john McTiernan, one of the best action directors ever, at the top of his game. What a high profile novel to adapt - Tom Clancy’s massive bestseller, his brand of immensely detailed techno-thriller was more than just a submarine movie, but a global political thriller exemplifying the ‘cold’ part of the Cold War. Jack Ryan (Baldwin) a lowly CIA theorist and naval strategist catches wind of secret photographs of the vessel through his mentor Admiral Greer (Jones). His sleuthing takes him to a number of different high level personnel to vet his theories on what this new vessel could be. His visit with Skip Taylor (Jeffrey Jones) the retired naval captain reveals the possibility of the cloaking device. At his brief with the Joint Chiefs he surmises a potential defection by the ship’s captain, a theory which is at odds with the government intel of Ramius as a potential rogue madman looking to launch missiles himself. 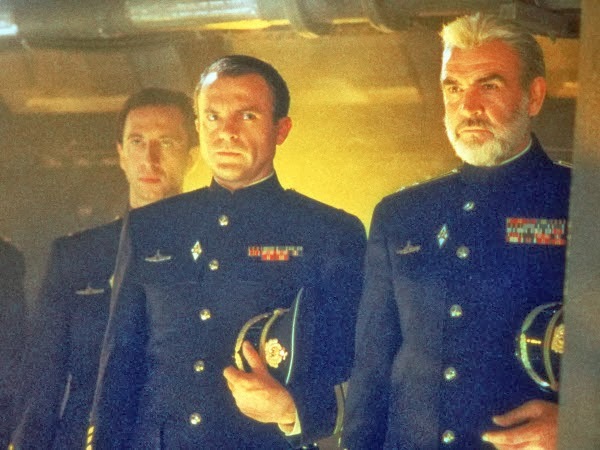 On board the Red October we the action of Ramius and his crew where for much of the picture their motivation is left mysterious. McTiernan wrings much tension from every subtle glance between captain and first mate and the crew down the chain. As Ramius Connery’s is well cast, exuding the cocky and confident authoritative demeanor he brings to all his film including his for Oscar The Untouchables and of course, the role which made him a star, James Bond. The USS Dallas, a US sub operating in the North Atlantic by Scott Glenn and his eager sonar-geek played by Courtney B. Vance, helps merge the Red October narrative track to the Ryan narrative track. Remarkably for such a high level production designed for mass market consumption the tricky military and political plotting never gets dumbed down. As per Clancy’s writing there’s as much thrill and tension in the boardroom confrontations with military brass as there is under the water. Ryan’s meeting with the Joint Chiefs is an impressive scene and a showcase of Baldwin’s chops as leading man. Same with Ryan’s head-to-head with Dallas Captain Bart Mancuso (Glenn) where he fakes him out by predicting Ramius’ next ‘Crazy Ivan’ maneuver. At all times we’re aware of John McTiernan’s impressive skills as director. Again he employs cinematographer Jan De Bont (one of his last pictures as DP before he started wasting his talent directing), lensing the picture in anamorphic and impressively low lit creating a dense and brooding visual look. McTiernan’s unmistakable camera movement is admirably motivated by the action and emotion on the screen but creating a visually dynamic feel even when it’s just a few people talking in a room. As the Cold War folded that same year, we will only to get spy films as a matter of history. Red October in 1990 however fictionalized resonates on a level of contemporary urgency. The Hunt For Red October and the entire Jack Ryan series is all available on Blu-Ray from Paramount Home Media.